Premium Hardwood Root Double Shredded – All natural mulch grounded up from the trunks and roots of the tree. The product goes through the grinder twice. Premium Hardwood Root Triple Shredded – All natural mulch grounded up from the trunks and roots of the tree. The product goes through the grinder three times. If installing on a slope or in a windy area, this lays better than the double shredded mulch. Premium Hardwood Bark Double Shredded – All natural bark blend mulch grounded up from the bark of the tree. The product goes through the grinder twice. This mulch is darker in color than the root, and holds its natural color longer than the root mulch. Premium Hardwood Bark Triple Shredded – All natural bark blend mulch grounded up from the bark of the tree. The product goes through the grinder three times. This mulch is darker in color than the root, and holds its natural color longer than the root mulch. Black Dyed Double Shredded Mulch – This product holds its color the longest. It is dark black in color. 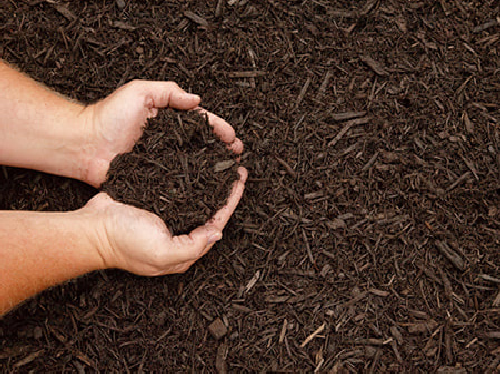 Brown Dyed Double Shredded Mulch – This product looks natural, but holds its color much longer than the natural mulches. Red Dyed Double Shredded Mulch – This is a decorative mulch that is a vibrant red color. 100% Bark Mulch – This mulch is exclusively made from the bark of the tree. Certified Play Ground Mulch – This is a double ground sport cushion that is an all clean wood mulch product. We recommend this for safety reasons. It is soft to walk on and is certified by the state to be safe for children to walk on. Independently tested, our sports cushion meets ASTM guidelines and is proven to have fall protection from 12 feet if installed at a depth of 12 inches. Wood Chips – This is naturally inexpensive ground cover which should be kept away from your house. This is also great for nature walks. Things to remember: When the forecast is calling for rain in 12-24 hours we do not recommend that you install any dyed product. This mulch needs time to cure and if it is not dried it could run down your driveway as well as bleach out the color. A-1 Mulch offers bulk hauling for mulch and playground mulch. Q: Is your dyed mulch safe for plants, animals, children and the environment? A: Our supplier states that it is environmentally friendly and is safe for plants, animals, and humans. Q: Can I install your mulch over existing mulch in my mulch beds? 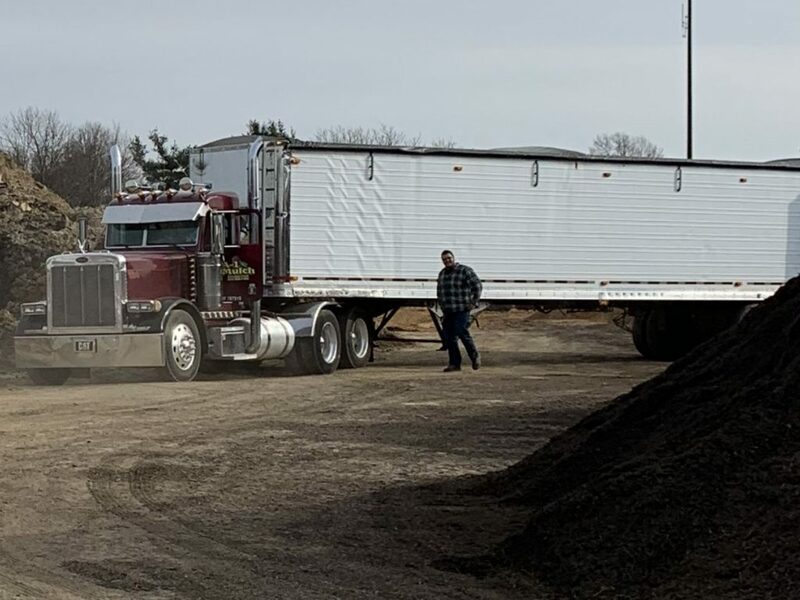 A: It is recommended that if you have not purchased your mulch from us in the past that you strip your beds and start new to eliminate mushroom growth. We recommend that if you already have mulch installed three to four inches thick and it has become matted, you should remove existing mulch, apply pre-emergent, weed killer, landscape fabric, and then re-mulch the bed. Q: How many inches thick should I spread my mulch? A: On new beds, three inches is recommended. When redressing existing beds we recommend two inches. Q: How much mulch or stone do I need? A: You can use our mulch or stone calculator below or give us a call with the dimensions of the area you are covering and we can give you a recommendation. You could also e-mail with this information and we will promptly return your e-mail with the information you need. Q: How much does a yard of mulch weigh? A: A yard of mulch weighs approximately 900 lbs which is roughly ½ ton when dry. Q: How much mulch will my pickup truck hold? A: If you have an eight-foot bed, it will hold two yards of mulch comfortably. A six-foot bed will comfortably hold one yard. We always recommend that you cover your load when leaving our yard. Q: How is mulch sold? A: We sell both our mulch and topsoil by the cubic yard. Our mulch contains no construction debris, tree or brush trimming waste or pallets. No mushroom soil or other farm products are added as fillers.